French Architect Has Designs On Vegas Desert One of France's most famous architects is making his mark in Paris and other cities, despite his talent for designing buildings that disappear into the landscape. 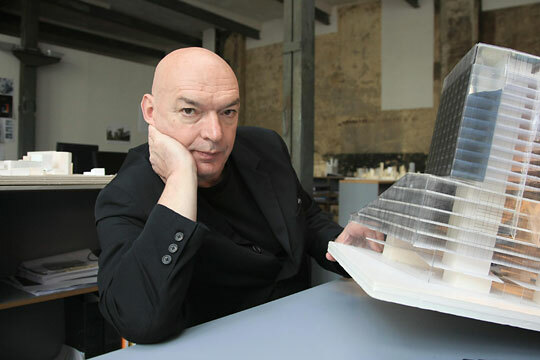 Earlier this year, Jean Nouvel won the Pritzker Prize, architecture's top honor. His next project could take him to Las Vegas. 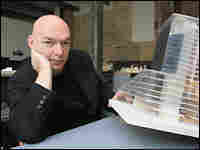 Jean Nouvel in Paris after being named the winner of the 2008 Pritzker Architecture Prize. The award panel commended his "challenge of accepted norms in order to stretch the boundaries of the field." One of France's most famous architects is making his mark in Paris and other cities — even though he sometimes designs buildings that are meant to disappear into the landscape. 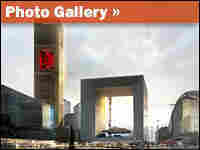 Earlier this year, Jean Nouvel won the 2008 Pritzker Prize, architecture's top honor. Nouvel is not very well known in the United States — he designed the Guthrie Theatre in Minneapolis and a small condo building in Manhattan. But in Paris, Nouvel is famous. And his most recent building — a museum of primitive civilizations — is very controversial. It's on the Seine River near the Eiffel Tower, a spot that is sacred in many French hearts. Nouvel made the museum low and set it back from the beloved waterway. And the wall that faces the river will, he hopes, eventually get lost behind a garden. "We need some years" for the landscape to improve, Nouvel said. "You will not really see the building after 10 years; with the trees around it, it will be a kind of secret building in Paris." The approach is typical Jean Nouvel, not diverting attention from what Paris loves — its tower, its river — making a mark by fitting in. Christine McEntee, head of the American Institute of Architects, says Nouvel does that with all his buildings. "They're all unique," McEntee said, "unique to where they fit and what the client, community [or] city is looking for, what that particular building is about." Nouvel shows a high level of innovation and adaptability, says Ron Bogle, who runs the American Architectural Foundation. "I think Nouvel would argue that he has no signature," Bogle said, "that he lets each building express itself in its context." That quality is quite unusual for an architect — to avoid promoting, or even identifying, himself through his designs. In person, Nouvel is an imposing figure. Approaching 63, the architect is tall and hulkish. Yet his designs and his manner seem modest, despite the Pritzker Prize, the brace of commissions from various emirates, and the prospect of a 75-floor glass skyscraper next to New York's Museum of Modern Art. Asked what it means to an architect to be able to make a mark on the skyline of Manhattan, Nouvel said, "You cannot imagine what this is for a little guy from the southwest of France, who wanted to become a painter and who became an architect by mistake. This is really something unimaginable for me." Recently, Nouvel won a competition for a big project in Las Vegas. It will be a 4,000-room hotel, with a casino, a convention center, a theater and a mammoth aquarium for sharks and whales. It's a grandiose French plan for an addition to the great American desert.